Airbrush Asylum: Pet Portraits now available with $10 from each canvas sold donated to Oscars Law. Pet Portraits now available with $10 from each canvas sold donated to Oscars Law. 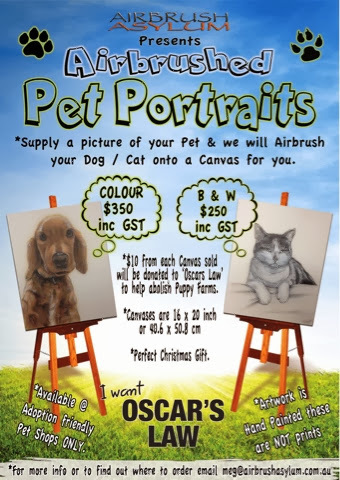 Airbrush Asylum is now doing Pet Portraits and we are proud to donate $10 from each canvas sold to Oscars Law to help abolish puppy farms.